Hi, I am trying to change font colour for specific blocks of lyrics. I can select the block of lyrics by shift dragging around them, or individually control clicking the lyrics. The problem is that when I adjust text properties it is only adjust the properties for one lyric element. I've tried this several times and I can see forum threads discussing similar issues but they are mainly on how to select... not how to apply properties once selected. 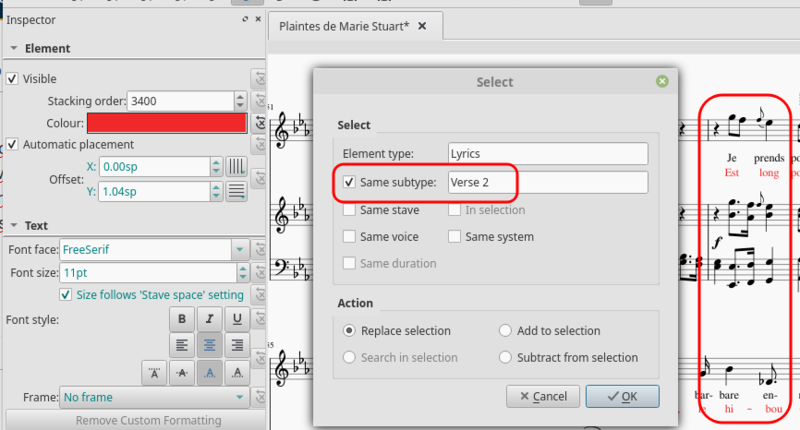 The easiest way would be to select another color in the inspector for the selected block of lyrics. Thanks kuwitt for your speedy reply. That worked fine. I don't know why the same thing didn't work when I used text properties via right click.... but you've introduced me to the inspector (which as a relative novice I hadn't been using) and problem solved. Text properties only works for one element indeed. There are technical reasons why, but I'm not sure it will always have to be that way. BTW, if this is something you are doing more than just a little, you should consider defining a custom text style for this and then just applying that (also via Inspector). You don't have to do each element individually. Select a whole verse at once with right-click, Select / More / Same verse, then change them all at once.